No longer in print, this paperback poetry collection is currently available from second-hand stores and websites such as MX BookFinder. Difficult to look. I mean at anything, to make the eyes stay put. wherever something might be missed. do anything but fix our gaze. A common cat can stare us down. In galleries eyes seek whichever picture’s not in front. at that fixed thing before us. she saw them window-framed but free. In Italy she took to napping on the Pitti’s long red benches. A wind blows within us. When it stills we become eyeless earth. 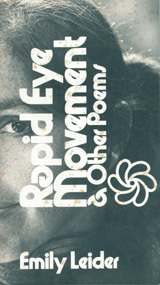 From RAPID EYE MOVEMENT & OTHER POEMS by Emily Leider (San Francisco: Bay Books, 1976).